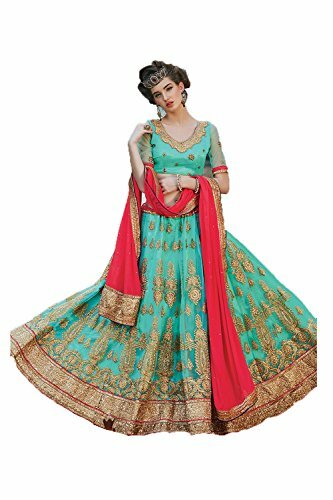 The Indian bridal wears for women are colorful, unique and gorgeous. Many of them look purely traditional, but there are also the latest ones designed with both traditional and new designs. India is the country where you can see so many different cultures, many different religious faiths, and more than 1500 different languages out of which 22 are officially used. Whatever the differences in culture, there is one thing in common.The colorful Indian weddings. In many places, the weddings include so many days of celebrations, while in some cultures the wedding ceremony takes only a few minutes. However, traditional wedding celebrations are grant family celebrations, mostly including many number of guests. The preparations for the weddings can take many months. The ethnic Indian bridal wears may differ slightly from place to place, but they are always so unique and gorgeous. Sari is still the most traditional bridal wedding dress for Indian women and it is popularly used across the country, but today we have more options to choose from. Here we will have a look at one of the most common bridal wears, the lehenga style sari, which is trendy among women in India right now. What is a Lehenga style sari? It is a blend of the traditional dresses lehenga and the sari. 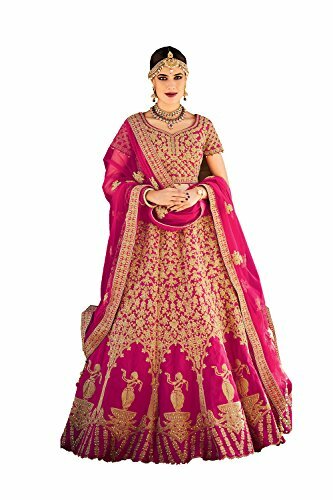 The traditional Indian wedding lehenga for women comes with a top and skirt, and the sari is a long one piece cloth, about 5 to 6 metres long, that needs to be draped around. Wearing a sari is some times a tedious task which makes it impossible to wear if you don't know how to wear it. It takes practice and patience. The lehenga style sari is actually a ready made sari which is easy to wear and it looks great for weddings and other celebrations. Right now it is very popular in India as a bridal wear and party wear among women. 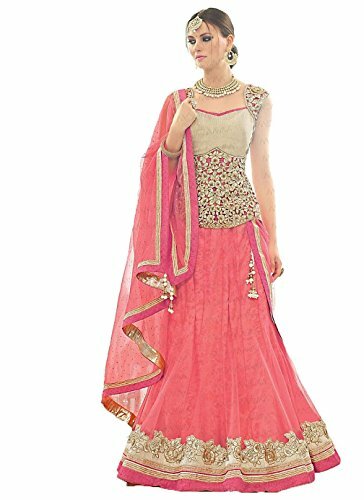 Just like the traditional lehengas, it comes with a top, which may be short or long, and a full skirt which is usually put on top of a separate skirt that you buy separately and you will get a third piece which you can easily put over your shoulders just like a sari. Since the third piece is a separate piece of cloth, just like a dupatta, you have more options on how to wear it. Some brides prefer to wear it just like the traditional saris, and some prefer to wear it in more fashionable ways. It all depends on your preference and imagination, but there are certainly some great and popular ways to wear it!. Many brides use the dupatta to put the veil, but that is not mandatory in every case and it may depend on the religious faiths too. Many of the dresses displayed here doesn't come stitched (some of them come as dress materials which you have to stitch) so you have to check the product descriptions of each dress to see if they will customize it and stitch it for you, as you make the order. 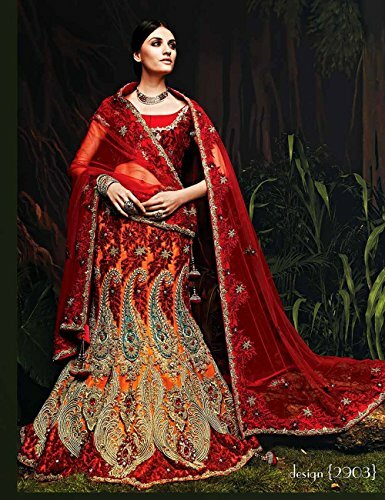 Red dominates the Indian bridal wears, be it sari or lehenga. 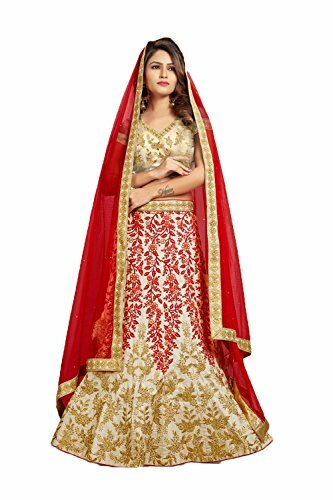 If you search about the Indian wedding dresses, the first thing you notice will be the popularity of the red color in bridal wears. It is not a must, but it is preferred by most. According to the Hindu beliefs, red color symbolizes happiness and good luck in marriage and it is also the color of strength. The other similar shades that are popular include orange, pink, purple and violet. It is actually a choice of the bride and it is completely a personal choice, so you can also find beautiful blue and green dresses as well. You can make it such a colorful thing, sky is the limit when it comes to colors. 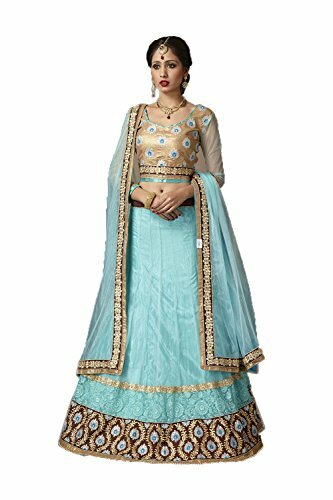 The Indian bridal dresses for women are quite expensive, but it is not uncommon in India to buy expensive outfits for weddings. It is not just the fabric that makes the Indian wedding dresses so expensive, the price is also because of the unique and ethnic embroidery works that you find in these dresses. Many times they are hand woven which again cause a hike in the price, and the addition of stone works, beads, pearls, mirror beads and sometimes even precious stones can cause the prices go soaring. I have also included wedding dresses for lesser amounts in this article. You can also see so many brides in pure white or ivory colour dresses, but it is mostly seen in the traditional Christian weddings. Even in such marriages, the bride mostly changes her dress to a bright coloured sari, mostly red, gifted by the groom right after the wedding ceremony. 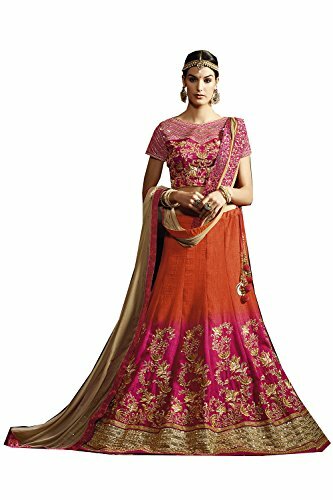 While the Christian brides usually wears a white or ivory coloured sari or gown for the marriage ceremony, the bridesmaid and those very close to the bride usually wear colourful lehengas or lehenga style saris. In most of the South Indian weddings, there are two wedding dresses for the bride. One chosen by the bride and one gifted by the groom. In both North Indian weddings and South Indian weddings of both Hindus and Muslims, you can mostly see the brides dressed in red or similar shades like bright orange, maroon or pink along with other bright colours or light colours of their choice and golden coloured borders and golden coloured embroidery works. The wedding dress is usually full of golden coloured or silver coloured hand woven embroideries and also stone works and mirror beads. In North India, it is very common for Hindu and Muslim brides to use lehengas and lehenga style saris. In South India, bright coloured silk saris with golden embroideries are mostly chosen for the marriage ceremony, but the brides use lehenga and lehenga style saris for engagements and wedding receptions. An interesting fact about white colored wedding dresses in India is that white or off white colored sari with golden colored border is the traditional sari of Kerala, which is the Southernmost state in India. Years back, the brides used to wear this traditional white colored sari for their weddings. Today, even the brides from Kerala wear bright colored silk saris for their weddings, and right after the wedding ceremony they change to the traditional Kerala sari which is white or ivory colored paired with golden embroidery. This is a actually a fantastic innovation. The dress is actually a lehenga style sari with full skirt and top, but the supposed third piece is already stitched into the skirt. So if you prefer to wear the dupatta just like you drape the sari and if you want to do it really quick, this is the product for you. The only downside is that you may not be able to wear the dupatta in some of the styles that you may like. If you look at the lehenga style sari featured here, you can see it looks just like a real sari. But the blue colored parts of the dress are actually two separate pieces, one is the full skirt with pleats and the other one is the top. 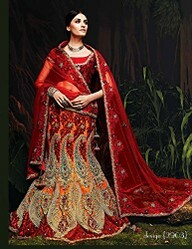 The red coloured dupatta is not a separate third piece, but it is already stitched with the blue full skirt. 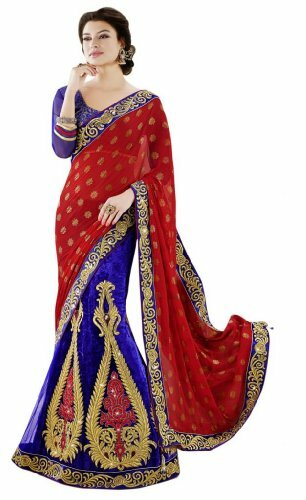 The great colors and embroidery works make it look so beautiful just like a sari. Here you can see one more two piece lehenga style sari in Magenta colour. The prices for these dresses are affordable too. These dresses are not stitched, but it is mentioned that you can request for a customized stitching. When it comes to the way people dress in India, regional preferences are more prominent than the religion based preferences. For example, you can see many common traits in the way people dress in South India regardless of their religion. Similarly, many common traits are observed in the way of dressing among people in North India regardless of their religion. Still, among the people living in the same regions, you can see many differences in the way of dressing based on their religion. 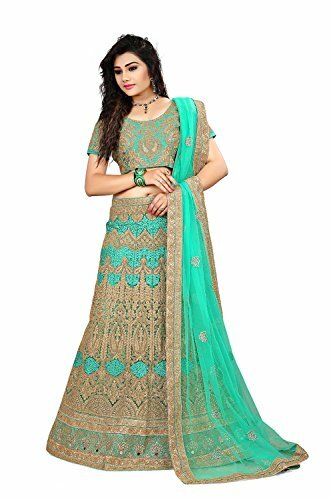 In the case of bridal wears, North Indians go for the lehenga or lehenga type saris for their marriage ceremonies and also the engagements and wedding receptions. In South India, traditional saris are more commonly chosen for the marriage ceremony, while they love to wear lehengas and lehenga style saris for engagements and wedding receptions. After all India is a place known for its diversities! Some of the lehenga style saris displayed in this article come stitched, but some of them are not stitched and you may have to request for a customized stitching based on your requirements. Love these amazing photos and the bridal wear. Thanks Jo :) thank you so much for your support! Wow, some of these are incredibly beautiful. VioletteRose, Embroidery adds so much elegance to wedding dresses. The red styles which you included are so rich and vivid that it is easy to understand red as a symbol of happiness and good luck in marriage and as a color of strength.